One of the most sacrosanct places in India as considered by the followers of Hindu religion, Amarnath temple is dedicated to worshipping Lord Shiva. It is located in the state of Jammu and Kashmir at a height of about 12,760 feet. Devotees visit the Amarnath cave every year for getting a pious glimpse of Lingam of Lord Shiva which is believed to be formed naturally from ice. The temple is only accessible for a short duration during the year in the month of July to August, when the ice Lingam is formed. The scene during the time is absolutely unbelievable and that makes people to believe in the sanctity of the place. From the top of the cave, water slowly trickles down which freezes to form ice, which after forming a solid base starts taking the shape of Shiva lingam and it acquires the complete shape on Purnima. It’s been mentioned in Hindu scriptures that Lord Shiva explained to his beloved wife, Parvati the secret of life. There is much more to know about the temple and its sacred story. 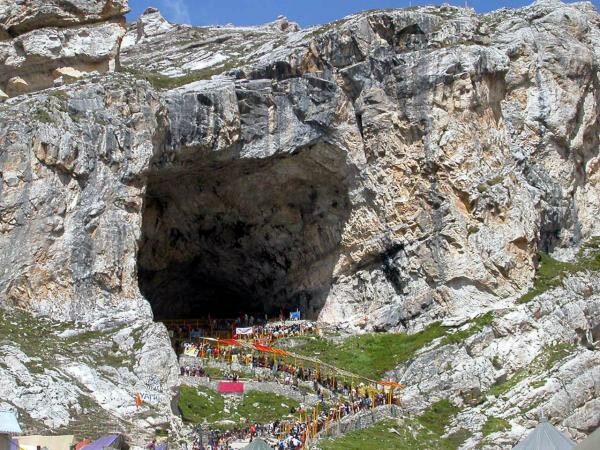 Amarnath temple is located in Kashmir, 145 km east of Srinagar and the trek begins on the panchami day of the bright half of the month at Srinagar. The first halt of the trek is at Pampur which is nine miles away from Srinagar in the South East direction. The next stop is at Brijbihara, Avantipur and Martand which is famous for its great ancient temple dedicated to God Sun. Other subsequent halts in the way are Aishmukam and Pahalgam. Pahalgam is reached on the day of Dasami and is the confluence of rivers Liddar and Seshnag. The next halt is Chandanwadi and Pishu Ghati. Pishu Ghati is believed to be the place where demons were killed by Gods. Moving further up, at a height of 12000 feet, there is Seshanag lake from where Seshanag River flows. After that, at a height of 14000 feet there is Mahagunus paas, which slopes down leading to Panchatarni. And finally on the full Moon day the Amarnath cave is reached. Though, he is called by people and some great sages by many names, there is only one being as per the Rigvedic verses. The scriptures have a famous verse, “Ekam Sat”, which means there is only one truth. The Parmeshwar has believed to have taken up the affairs of the world in three forms which is called as Holy Trinity. According to the Rigveda, Shiva is considered as the deity who is the purifier of Good and destroyer of evil. Lord Shiva is believed to be a living God, whose presence has been testified from the astronomy, Vedic myths and even some rituals. Findings from Harappa and Mohenjo-Daro verify that, Lords Shiva was a much revered deity of ancient India. The Amarnath cave has a special significance associated with Lord Shiva. It is said that, Shiva narrated the story of the creation of the universe and the secret of immortality to his companion Parvati, here in this cave. Scriptures say that, once upon a time, Maa Parvati curiously asked Lord Shiva, the reason that made him to wear Mund Mala or beads of head, upon which he replied that, beloved every time you are born, I wear a new head and add it to my Mund mala. This perplexed Parvati and she asked Lord Shiva, why it is that he is all immortal and she die every time, and her body gets destroyed? Lord Shiva then replied to Parvati, this happens because of the Amar Katha. Upon continuous demand from Maa parvati, he chose a secluded place (so that no one else would be able to listen to the story), to narrate to her the secret of the story of the creation of the world and the most suitable place he found was Amarnath cave. For the same, he left his bull Nandi at Pahalgam, on which he made his rides, at Chandanwari he left Moon taking it out of his hair, at the bank of Sheshnag he left his snake. He also left his son Ganesha at the Mahagunas Parvat and at Panjtarni he left behind all the five elements that is air, water, earth, sky and fire which are believed to be the building blocks of human beings. Lord Shiva and Parvati also performed Tandav dance as a symbol of sacrificing the earth and reached to the Almarnath cave to carry on their narrative. Lord Shiva then sat on Samadhi on to the skin of the deer and went into concentrating. In order to make sure that no living being could listen to the story he created Rudra whom he names Kalagni. Shiva asked Rudra to fire up the cave so as to eliminate every trace of a living being. He then started off with narrating the story of the world to Parvati. Inadvertently, an egg which was lying beneath the skin of the deer, got protected and it is believed that the pair of pigeons which were born out of this egg became immortal having listened to the story of the Amar Katha. At various occasions’ people, while trekking the arduous route have seen the pair of pigeons.